PureSurf Desktop provides affordable Internet filtering to protect your family from inappropriate content, illegal downloads, online predators, and cyber bullies. PureSurf Desktop can allow or block all popular Instant Messaging (IM) and Peer-to-Peer (P2P) protocols. If you choose to allow IM access, you can filter conversation keywords and phrases from Yahoo! 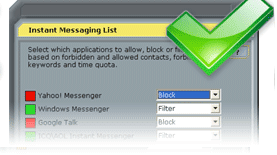 Messenger, Windows Messenger, and ICQ/AOL. This will allow you to block telephone numbers, your home address, and other private information from the conversation. You can receive alerts via e-mail directly on your mobile phone from content access violations, unsuccessful overrides, tampering, and keyword/phrase detection. Complete reports are stored locally, so you can view all web sites that were visited and all IM conversions that were made.